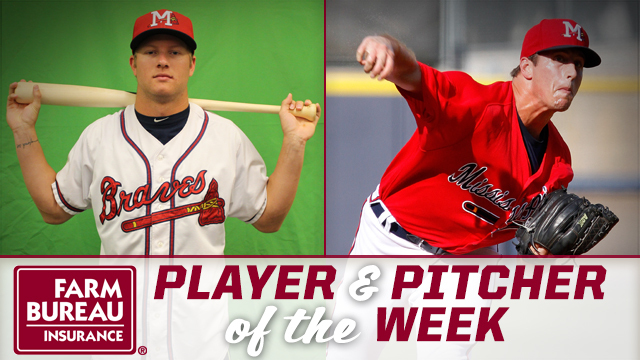 PEARL, MS-Outfielder Dustin Peterson and RHP Lucas Sims have been named Mississippi Farm Bureau Player and Pitcher of the Week for the week ending Sunday, April 17. Peterson, 21, posted a .320 batting average in seven games through the week of April 11-17. He had a double, a homer and six RBI. For the season, Peterson is hitting .310 in 11 games. The Arizona native was acquired by the Braves as part of a six-player deal with San Diego that sent Justin Upton to the Padres in December 2014. Sims, 21, made two starts during the week of April 11-17. Despite a 0-1 record, he posted a 1.86 ERA and struck out 17 batters in just 9.2 innings of work. On the season, Sims is 0-2 but has a 1.84 ERA with 26 K's in 14.2 innings pitched. Opposing teams are hitting .140 against the right-hander. A native of Lawrenceville, GA, Sims was selected by the Braves in the first round of the 2012 draft. The M-Braves continue a 10-game homestand tonight with game two of a five-game series against the Lookouts. The Braves wrap-up the homestand with five games against the Biloxi Shuckers April 22-26.